Face of a Lonaconing Fleming? Since writing my previous posts about the McAlpine family of Lonaconing, Maryland, I was able to borrow a copy of The Lonaconing Legacy: Its Cornish and Scottish Sons and Daughters, by Thomas Witwer Richards and Sally Miller Atkinson. Primarily a genealogy of the authors’ families, the book, published in 2000, offers fascinating glimpses of what life was like for immigrant coal mining families, especially the tight-knit clan of related Peebles, Richards, Loves and McAlpines who lived and worked in Lonaconing during its coal-mining heyday. Janet Douglas Peebles (1814-1892), widow of Thomas Peebles Sr. (1812-1859), had a brother who came to Lonaconing in 1851. John Douglas “became mine boss with the George’s Creek Coal and Iron Company in 1853,” and then was promoted to Superintendent in 1863 (Legacy, 130). “Douglas relied upon his Peebles, McAlpine, and Love kinsmen to form the backbone of the company’s work force, and the better jobs were available to them. . . . Family members had job opportunities even in the slowest of times” (Legacy, 130). Close ties with company management may have made these workers less amenable to labor organizing, minimizing strikes and unrest. Extended family provided personal support as well, such as living quarters for relations and helping widowed miners with child care. But besides filling in some of the detail about life in Lonaconing during its coal mining height, the book includes reproductions of rarely-seen early photographs of family members. Several photographs of Fleming sisters, especially portraits of Mary Fleming Peebles (1839-1915) wife of Thomas Peebles, Jr. (1836-1911), in middle age, bear resemblance to the unidentified photograph of the middle-aged woman in the portrait above. But is the timing right? According to Kelbaugh’s Directory of Maryland Photographers 1839-1900, Cumberland photographer Thomas L. Darnell used the advertising mark “Darnell and Son” from 1880 to 1901. This doesn’t help us narrow down the photo’s date, but her clothing might. 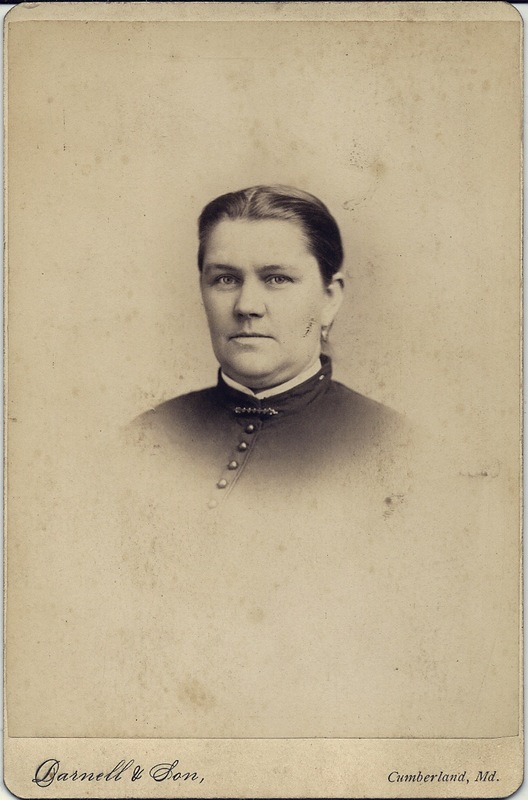 Her hair still dark and lustrous, the woman in this cabinet card photograph appears to be in her late 30s or 40s. Her dress’ high collar with linen band, and tight, button-decorated bodice reflect 1880s fashion (see Joan Severa, Dressed for the Photographer: Ordinary Americans and Fashion, 1840-1900). So, if we guess at an 1880s date for this portrait, the subject might have been born in the 1840s. Elizabeth Fleming (1848-1909) was born in Denny, Stirlingshire, Scotland. Richards and Atkinson relate that Elizabeth met her future husband, John McAlpine (1845-1914), while sojourning in Lonaconing with her elder sister, Mary Fleming Peebles. Elizabeth Fleming McAlpine would have been in her late 30s or early 40s at the time of this portrait, and I am sorely tempted to conjecture that she is the subject. Sally Miller Atkinson, a descendant of this group of related families who has done extensive research on her ancestors, has looked at the photo, however, and asserts that she does not recognize the woman. So, without further visual evidence, the mystery persists.